9 ^6 / / A.
.' .,t ..- ; '. r "
$1,541.0 million and about 21 percent higher than the October exports of manufactured foodstuffs from $96.8 to 4102.3 million. 1959 total of $1,382.2 million. million; merchant ships, from $0.6 to $13.7 million; motor trucks by an increase in exports of corn, from $17.4 to $20.6 million. 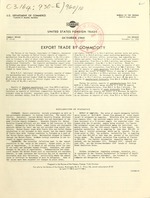 costs beyond the United States port of exportation are excluded. the values have been adjusted for changes in price level. Canada with the 10 percent sample being retained for Canada. Commerce and Navigation of the United States. Hides and skins, raw, except furs...................value.. Animal and fish oils and greases, inedible.......1,000 lb.. Vegetables, fresh or dried.......................1,000 lb.. Fruits, fresh or frozen..........................1,000 lb..
Meat and meat products...........................1,000 lb.. Fish, canned, prepared, etc......................1,000 lb.. Fruits, dried and evaporated.....................1,000 lb..
Fruit . ',jl -s .................................... 1,' gal.. Vegetable oils, fats and waxes, refined ..........1,000 lb.. Naval Stores, gums and re ins ................................. /value. .'. See footnotes at en da table. value.. 18.2 18.3 16.7 17.7 15. 'Includes .9 million of Military Mutual Security Program shipments ( $21.0 million to Western Europe). maintenance and repair trucks, new" in the issues of Report No. FT 930-E for periods prior to January 1960.